View from the Birdhouse: Happy Vintage Halloween! Happy Halloween! 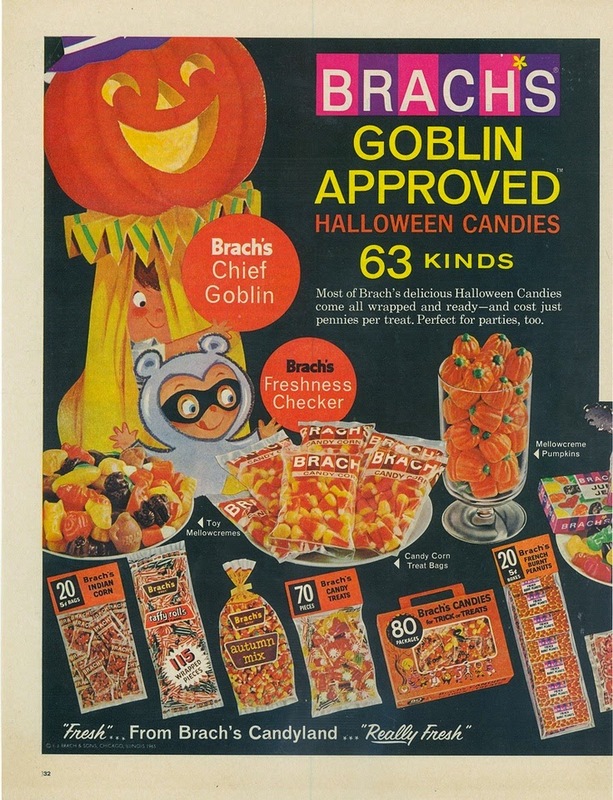 This Brach's candy ad is from 1965. What was your favorite Halloween treat? I loved candy corn and all the classic candy bars - Hershey's, Three Musketeers, Milky Way, etc. etc. etc. I remember the joy of coming home with a pillowcase full of candy to sort after trick or treating. I lived where we knew all of our neighbors, and the ones we didn't know, we trusted. (Vintage years!) For many Halloweens we were lucky to have homemade goodies put into our sacks. Popcorn balls, pound cake, candied apples, and different fruits along with the usual store-bought stuff. So much fun. My favorite candy was the Mounds candy bar. That is so neat! The homemade goodies sound yummy. I remember a few houses where the trick or treat candy was full sized candy bars. Those were great favorites!